�Attempt great things for God, expect great things from God� was the motto of that peerless �father of modern missions� namely William Carey. While it defined every area of his work for the Lord, it virtually consumed him when it came to translating the English Bible into several local Indian languages. Undeterred by several obstacles that came his way notably the major fire accident which destroyed his press on March 11th 1812 (in which several precious manuscripts were lost) he pressed on translating the Bible eventually into 44 languages and dialects. Now how�s that for life-time achievement, which transcends time blessing people of his generation and posterity! 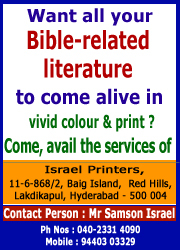 If you are amongst those who have been blessed reading Bible in Indian languages such as Hindi, Tamil, Telugu etc (http://www.wmcarey.edu/carey/bib/works_bible.htm) then praise the Almighty for giving the vision and inspiration to that humble yet much focused servant of God! Speaking of languages, �PowerPoint� is a wonderful �visual language of the Cyber world� at once firing one�s imagination, besides making the entire understanding process of a theme simpler and interesting. The inherent creativity involved in its operation ensures this. Since it�s advent in 1987, this Slideshow format has virtually stolen the show what with business people, educators, students, and trainers using it widely. Oh yes, several inspired men of God have already diligently come-up with creative Power point presentations (referred to hereafter as PPS) on the Books of the Bible and uploaded them in the Net in order it is of universal use to countless across the Globe. I took up the assignment of conducting Bible Study every Tuesday in my local Church (Christian Fellowship Church) from July 2010 in PPS format. Since then I have been Divinely-inspired to compile a �unique� PPSs� for all the Books of the Bible in order to facilitate better understanding of the same amongst the masses. Unique in the sense those slides where explanation is required/special insight needs to be provided would have associated notes/ancillary slides. An ancillary slide is a slide within a slide. In this series, for starters I am uploading the PPS on the Book of Genesis. At this stage, I would like to say that the Book titled �Genesis comes home� written by one of my spiritual mentors Brother P.K.D Lee (hitherto at the helm of affairs of Haggai Institute, Singapore) has been a wonderful resource material to me whilst compiling the notes for the PPS on Genesis. Though this PPS is on the First book of the Bible, a few slides haves been incorporated at the beginning of the Slideshow (serving as an appetizer before the main course) in order to present a broad overview of the Bible. I hope and pray that these PPSs� would also serve as a valuable resource to several co-servants of mine in His vineyard (Churches/Bible schools) as they strive sincerely to teach THE WORD with useful teaching aids. The Slides/ancillary slides with pictures carrying suitable titles/captions - mostly self-explanatory-along with Bible references (hyper linked to New Living Translation available in www.Biblegateway.com) are designed to serve the purpose of facilitating the observation process. I reiterate that supplementary notes again with relevant Bible references� (hyper linked to New Living Translation available in www.Biblegateway.com) are also being given to facilitate the interpretation and application processes�. It is sincerely hoped that the notes provided would remove ALL the �mental roadblocks�, the viewer of this PPS is bound to encounter, whilst navigating through it. b) After going through the notes and the ancillary slides, as the case may be, all the readers/viewers have to do to go back to main PPT is to click at the word �BACK�/Esc button at the right hand bottom corner of the notes page/ancillary slide. c) On opening the hyper linked Bible reference (from Bible gateway) provided in the notes, the viewers need to close the said web page of Bible gateway to come back to notes. While on the subject of notes, in conclusion I would also like to add that the cardinal, time-tested principle adopted by many a commentator-use scripture to interpret scripture- has been used by me also. Hence a plethora of cross-references� in the notes section, giving the viewers/readers� (hopefully) a fulfilling, deep Bible study experience! Prayer: Father, Thy Word can never return void, without accomplishing its work ( Isaiah 55:11), so I submit this work involving teaching Thy Word into Thy ALL POWERFUL, LOVING HANDS to be used for Your GLORY AND Your GLORY alone. Amen. The uploaded material - both the PPT and the related notes- IN THIS WEBSITE is in the public domain and may be freely used and distributed, of course, WITHOUT ANY CHANGES. Ps�Dear Friends, opening the zipped file and copying the same into your hard disk for viewing the slideshow, may consume some time (approx 10-15 minutes) depending on the Broadband capacity at your end. However, let me assure you, time spent in this exercise, would be well spent! CLICK ON THE LINK BELOW FOR INITIATING THE PROCESS OF OPENING THE ZIPPED FILE.